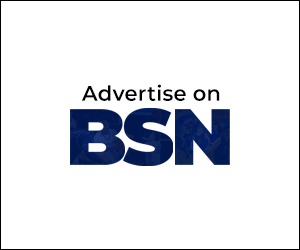 (NICHOLASVILLE, Ky.) – Billy Horschel, who after two rounds stands at thirteen under par and in second place atop the leaderboard, had some timely advice for Chip McDaniel prior to the start of this year’s Barbasol Championship. 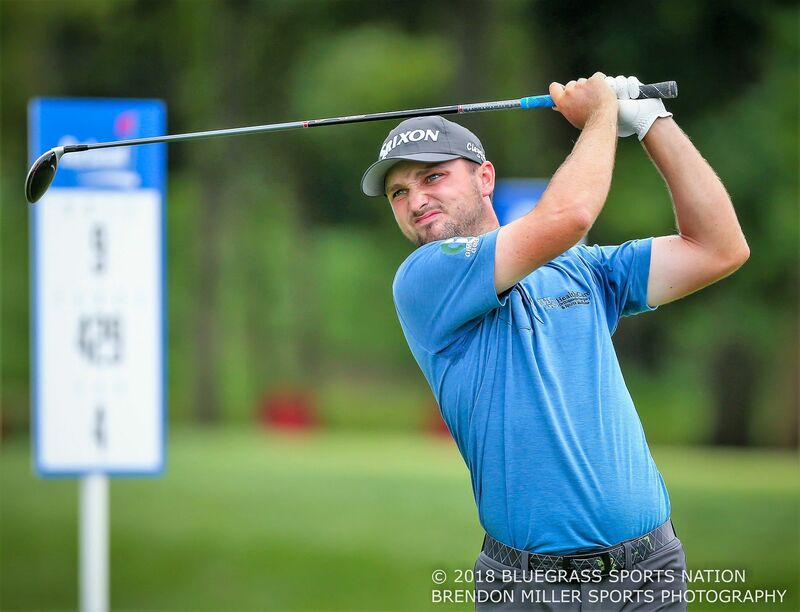 The former Florida Gator standout told the former Kentucky Wildcat star that one doesn’t have to be perfect to be successful in professional golf. “I think when I came out on tour I knew that,” said the 2014 FedEx Cup Champion and five-time PGA TOUR winner. “But in the back of my head, I just felt like I had to be perfect in every aspect of my game every week.” McDaniel, the hometown hero from Clay County, hasn’t been perfect this week in his professional golfing debut, but he’s already proven beyond a shadow of a doubt that he has what it takes to successfully compete with the big boys on the professional circuit.Forget that McDaniel shot a second round, six-under, 66 to go (-4) and make the cut. Let’s focus instead on what I’ve gleaned so far in my two days of shadowing Chip around the tournament grounds. I’m not talking about just his outstanding ball striking and incredible shot making talents. After all, how many golfers birdie the first hole or chip in for eagle in their first professional tournament? But rather, I’m talking about those intangibles required to complete the whole golfing package. Golfing pundits often refer to those intangibles as the “it” factor. Whatever the “it” factor is, Chip McDaniel seems to have a healthy dose it. I noticed it first in the pre-tournament press conference. McDaniel patiently answered questions with a laid-back, confident demeanor, belying the tension that had to be percolating underneath that cool and calm exterior. 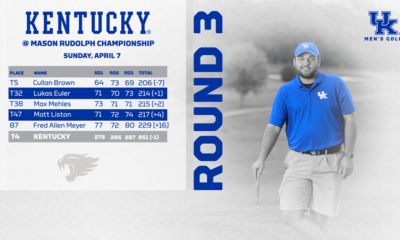 He and fellow UK teammate Cooper Musselman fielded reporter’s queries with surprising aplomb, interlacing their responses with a perfect mixture of sincerity, humor, and the wide-eyed innocence expected of first-time participants. I naturally noticed Chip’s smile, a genuine, sans orthodontic, natural grin—unleashed at just the right instant to disarm and charm. I noticed the “it” while in the gallery following Chip from outside the ropes—a mixture of family, friends, and neighborhood supporters eager to help him crush every drive and drain every putt. I love people’s reactions when someone from their neck of the woods makes it big, their eyes moistening and their voices quivering over such a vicarious sense of achievement. It can’t be easy carrying the hopes and dreams of your entire hometown on every single backswing. And yet, there Chip was—calmly and methodically balancing the birdies and the bogeys while keeping personal emotions solidly in check. I noticed the “it” from his girlfriend Sara and his sister-in-law Madison. They frequently walked the golf course together, casually and carefree, enjoying the moment as if they were out for a leisurely Sunday stroll. I asked them if they were nervous watching Chip in his first professional outing. “No, not really,” they both answered—as if channeling the quiet, confident bearing of Chip on the big stage. Just like their boyfriend and brother-in-law, they already understood that a single bad shot in one particular round shouldn’t detract from either the love of the game—or the love of the person. 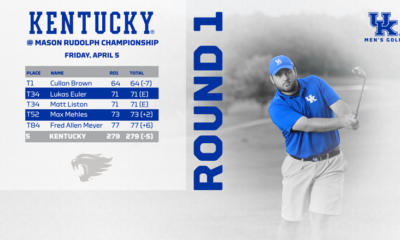 I noticed the “it” in University of Kentucky Golf coach Brian Craig, nestled comfortably under a wide-brimmed hat, out amongst the gallery, obviously beaming with pride at one of his star pupils reaching his dream. Coaches know that special ones like Chip appear only once in a blue moon. “Can’t be replaced,” he quipped, as he spoke glowingly of the bright future and successful career likely to come in the years ahead for his most recent protege. The “it” beamed brightly from Chip’s brother—and caddy—Todd. “You guys are just seeing the start of a thirty-year career with this kid,” Todd said. “He’s got all the talent in the world, and it’s just a matter of time before you see him do something like Justin Thomas.” That’s high praise indeed coming from your big brother. The two of them looked inseparable out there on the course. The “it” was obviously evident from Chip’s dad, Todd. I can’t fathom the emotions that had to be running through his mind. In the biggest tournament stage of his young son’s career, however, he was as cool as a cucumber. In fact, he talked to me about the importance of manners. Having served as a school principal for sixteen years, he knows the value of respect, deportment, and civility in today’s youth. From what I’ve witnessed thus far, his son truly is a “Chip” off the old block. And finally, I noticed the “it” in Chip’s mom Jennifer. I’ve discovered over the years that you learn a lot about an athlete by listening to what their mothers say about them. Mothers know best—right? A teacher at heart, Jennifer quickly pointed out that Chip was her best student in her AP Calculus class. Of course, she was relishing in Chip’s golfing success. What mother wouldn’t gush openly with pride? But I got a sense she was truly thankful, overcome with a sense of genuine gratitude, that her children were blessed with good health, gracious humility, a solid education, and the confident self-esteem grounded in their supportive and loving upbringing. Mission accomplished! Now it’ll be a quick two-hour turnaround before McDaniel tees it up for round number three. “I played well, but I definitely didn’t hit every shot perfect,” Chip told me, after his magical morning round. “It was just nice for the shots that weren’t perfect to end up OK.” For those back home in Manchester, Kentucky, it was more than just OK. It was about as perfect of a performance as anyone could have asked for. Congratulations, Tyler “Chip” McDaniel. Well done, sir! Well done!